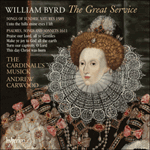 Byrd's setting of Unto the hills mine eyes I lift (Psalm 121) is drawn from his collection entitled Songs of Sundrie Natures from 1589. It has its roots in the past and sounds a little reminiscent of the old Flemish style of imitation such as used by Robert Parsons in his anthem Deliver me from mine enemies. Unto the hills mine eyes I lift (Psaume 121) provient de la collection Songs of Sundrie Natures de 1589. Tirant ses racines du passé, elle rappelle quelque peu le vieux style flamand de l’imitiation tel qu’utilisé par Robert Parsons dans son hymne Deliver me from mine enemies. Byrds Vertonung von Unto the hills mine eyes I lift (Psalm 121), die aus Songs of Sundrie Natures, seinem Band von 1589, stammt, hat seine Wurzeln in der Vergangenheit und erinnert ein wenig an den alten flämischen Imitationsstil, wie ihn Robert Parsons in seinem Anthem Deliver me from mine enemies benutzte. But from the Lord I look for help, that Heaven and earth hath made. With watchful eye will thee preserve, without slumber or sleep. The sun by day shall not thee burn, nor moon by night thee harm. And all thy ways both in and out, for ever shall conserve.